You will notice that I have a page called Tutorials. If you go there (PLEASE do), you will notice that I have begun to develop some on-line tutorials. You will also notice that each of the subtopics has a link to it, and if you go there, there is a tutorial associated with it. Students seem to like the tutorial, as it explains, in simple English, with examples, what that topic is about. The tutorials are based on my Power Point Slides (which are available to you also), but are slightly different (intentionally) and include more information. I have also drawn from other sources, or simply tried to explain things a little differently. They also all contain additional references to related websites AND questions (and answers) based on the material presented in the tutorial. You will also notice that each other general topic has a number of subtopics under it. Someof them do not have links to them; some other ones have asterisks next to them. As a student, you have a different perspective than I might have, and can better explain the topic to another student. You MUST choose the subtopic you wish to work on within the first two weeks of the semester. See the course schedule for topic selection due dates. Your submissions will be graded at the end of the semester. ??? What constitutes a good tutorial ??? That depends on whether you create a new tutorial, revision, or merger. If you go the Tutorials Page, you will notice that for the first topic (What does a bit stand for? ), I have 5 versions (Which I would grade as either an 'A', 'B', 'C', 'D', or 'F'). Each of these has an explanation for my grading. Also at the Tutorials Page, you will notice that there are 5 versions of tutrial 1.30: What is a byte, and why does it contain 8-bits?, one for the original submission, one a failing revision, one a 'C' revision, one a 'B' Revision, and one an 'A' revision. Each of these also has an explanation for my grading. ??? What is the difference between the options ??? If you create an original tutorial, I probably give you a little leeway. Since someone else has started the process for the revisions and mergers, I expect more. You must submit your tutorial at no later than the week after it is covered in class (so that I can post it, hopefully, before it appears on the quiz. Before you make your submission, go to the Selected Topics Page (found at the Tutorial Assignment Page) to see if anyone else has already selected the tutorial. I would prefer that you send me your tutorials as an HTML file, although I will accept tutorials prepared in Power Point or Word. 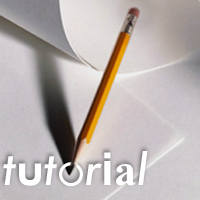 I have provided you with some information on How to use Front Page and the Revising a Tutorial Page. REMEMBER that if you have graphics in your tutorial, you MUST also send me the graphics files. This page was last updated on 08/07/04.